One often speaks of food as art, as edible masterpieces that inspire and excite- temporary creative installations that within minutes, at times seconds, disappear into the bellies of its admirers. First and foremost we feast with our eyes, and intricately layered vegetable kaleidoscopes and puffs of liquid nitrogen whimsies make us coo and swoon. 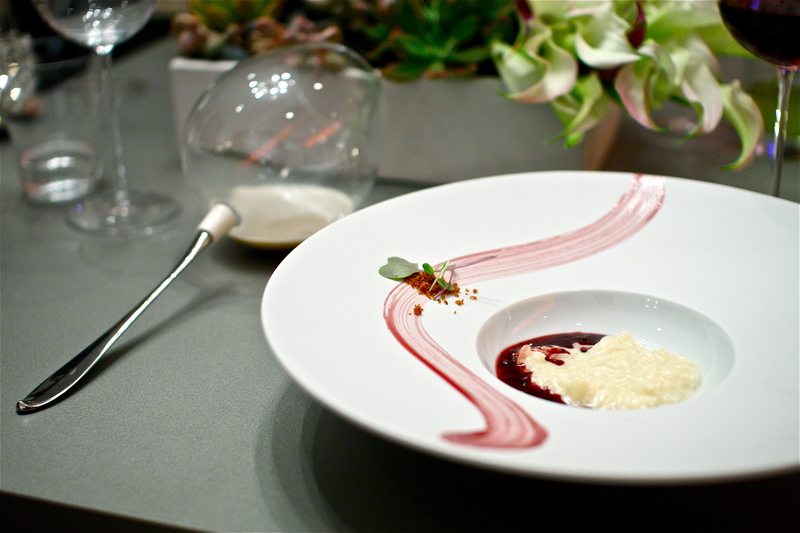 Science has given chefs more avenues through which to realize their culinary visions, expanding the possibilities for achieving the perfect texture, consistency and color to components that build both abstract and lifelike landscapes on plates. Food today is looking and tasting better than ever before. 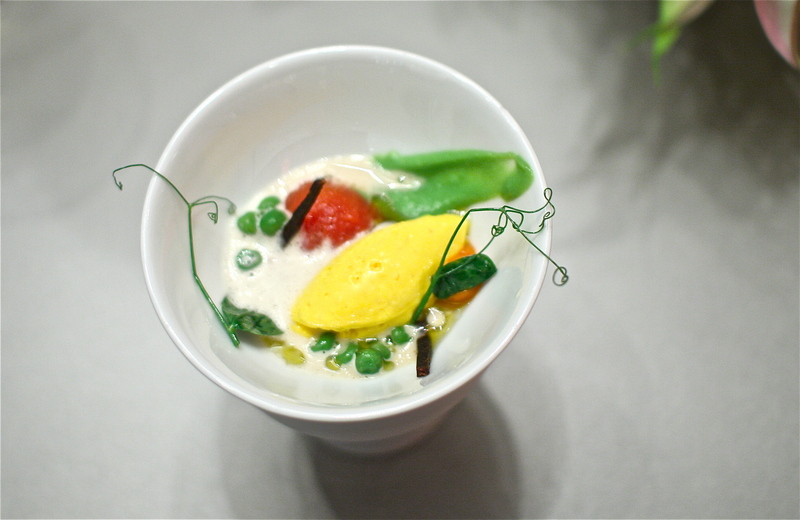 But if food is art, it should also make us feel and move us in ways that are unexpected. Art is a sensory experience directly synched with our emotions, our values, our memories, our thoughts, and everything else that makes us human. I remember standing in front of Georgia O’Keefe’s ‘New York with Moon’ at the Thyssen-Bornemisza museum as a teenager, a canvas of muted colors and simple shapes in contrast to the dramatic Dalí’s and Picasso’s that hung adjacent to it. The composition too is straightforward, the artist’s perspective of the moon and a lamppost on a deserted street corner in New York. Yet I stood, mesmerized, for hours, having an intimate conversation with the painting, feeling solitude, sadness and tranquility. “One can’t paint New York as it is, but rather as it is felt“, O’Keefe said of this painting, and I felt it- her, me, everything- so powerfully that it moved me to tears. Without the intensely charged emotional reactions that I am able to have with paintings and photographs, I hesitate to call food as art. Until now. I don’t even recall how I found out about Chef Roberto Cortez’s CR8 (‘create’) dinners- let’s just call it fate, an encounter that was meant to be- private dinner experiences for small groups of up to 10 by this Texan chef who, after years of working as a private chef, had just returned from Europe with a clearer vision for his craft. His vision is one of intimacy and sensuality, of experiencing food with complete vulnerability and humility, where chef and diners engage for an immersive journey created by food, sound, design and landscape; a concept which naturally keeps him away from a traditional restaurant model and explains why I ended up in a beautiful Bel Air estate, overlooking the Los Angeles skyline with an eclectic group of musicians, restaurateurs and artists. The first step in Cortez’s vision is to create a space, a unique environment that balances beauty, fantasy and magic. 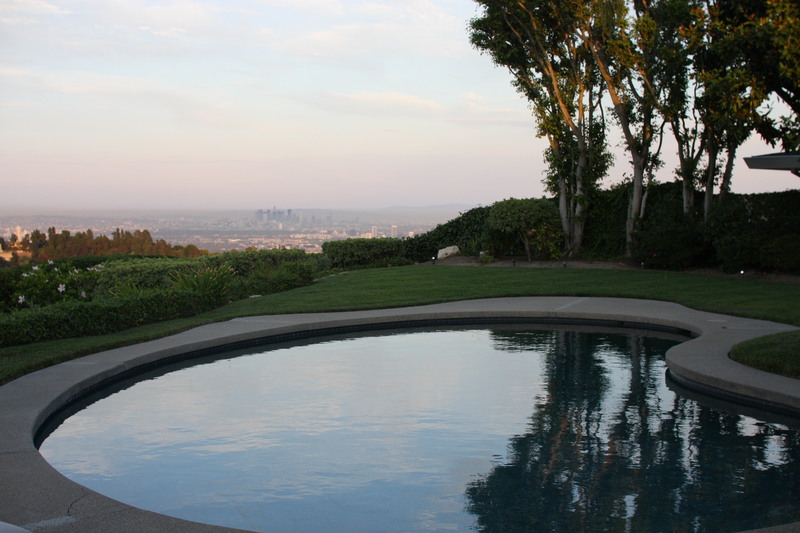 This particular Bel Air home, courtesy of a lovely couple who are both friends and fans of Cortez, is one such dream location, fitted with pinball machines, bright contemporary furniture, a warm blazing fireplace and a panoramic view of Los Angeles behind a pristine pool. It is somewhere between a Hockney and a Lichtenstein, and we have unknowingly become its central subjects. 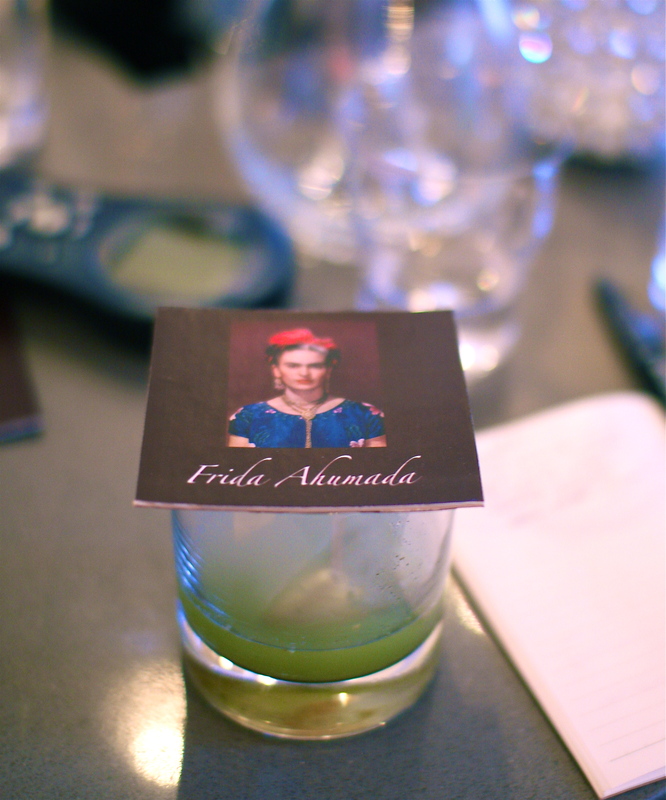 Guests arrive to a welcome of hickory perfumed smoke swirling out of a smoking gun with Cortez at the bar muddling poblano peppers for the Frida Ahumada, the Smoked Frida. 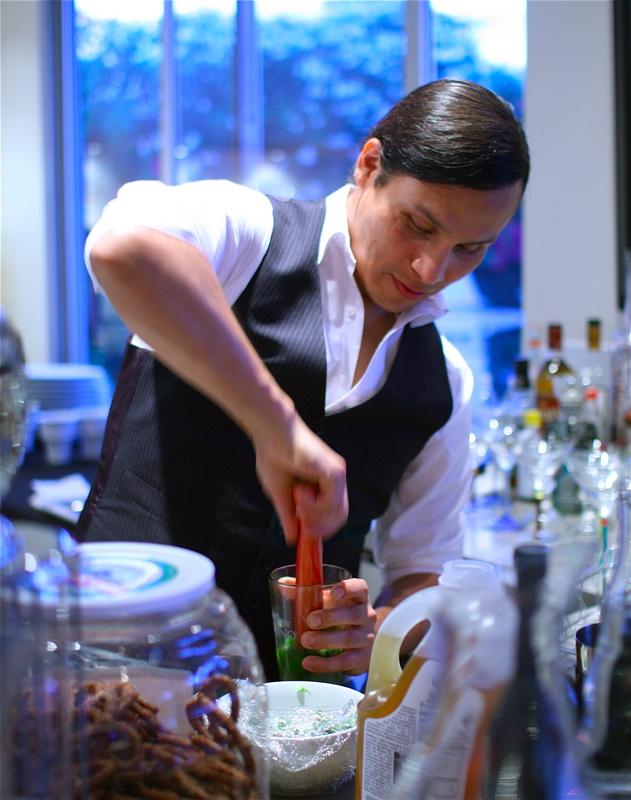 It is a magnificent cocktail of mezcal, coriander, cumin, apple and agave, full of the mystery, sexiness and power that the iconoclastic artist represents. The smoke is trapped under the custom-made coaster, just long enough for its aroma to permeate into the ice cubes until it is released, with a dramatic puff, for its debut. 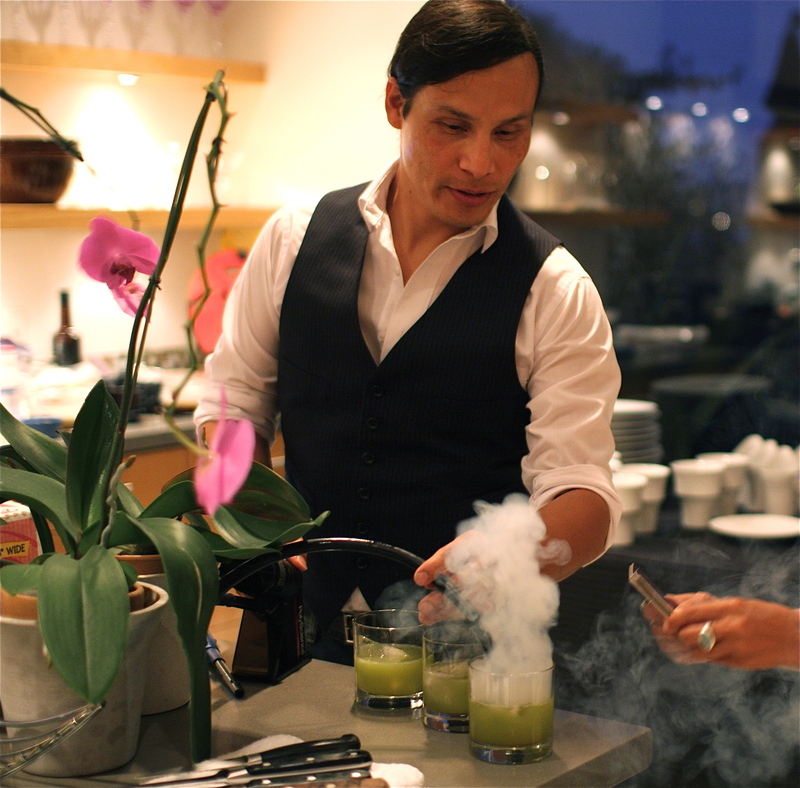 There are complexities of sweet, smokey and spicy, so wondrous that I order another glass of this seductive potion. 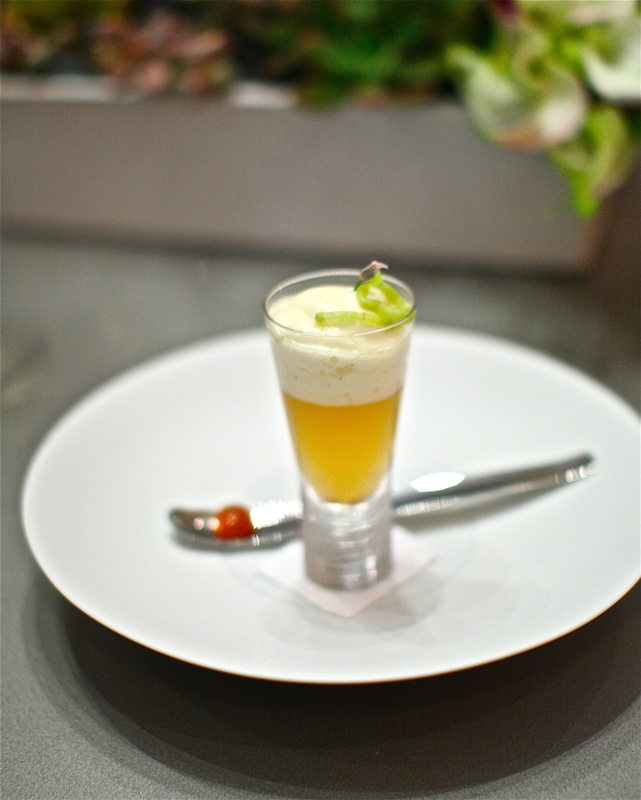 In ‘Farewell BBQ Summer’ Cortez takes us on our first culinary journey to the backyard, an amuse bouche of warm chicken consommé layered with frothy potato salad, homemade pickle strips and chive flowers. 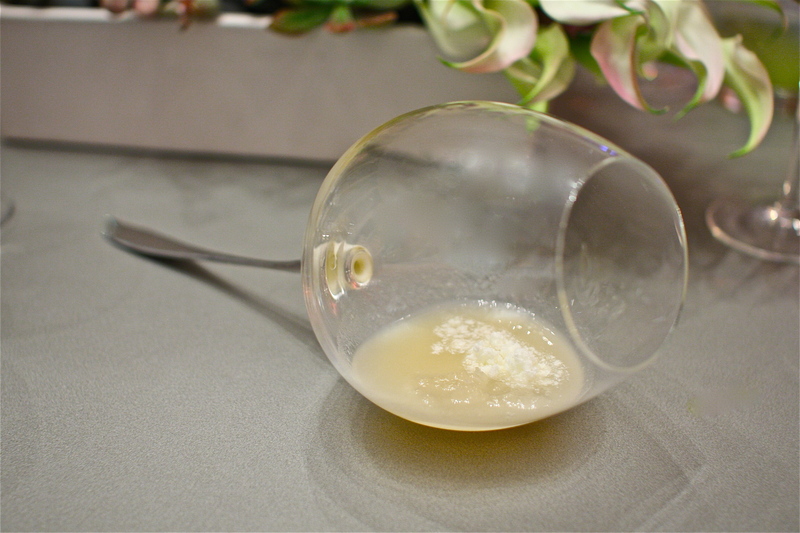 It takes me by surprise- it is one of the most delicious gulps that I have had all year, and it is only the amuse. I roll the red BBQ sauce sphere into my mouth and let its sweet tangy juices explode and dribble within, mingling with the residual chicken and potato flavors. It is edible nostalgia in a shot, and a decade of childhood memories come flooding back in one heavenly swig. ‘Enchanted paella’ is a study in textures, Cortez says, with bright saffron ice cream and bomba rice mousse whipped to a soft silky sheen, but it proves to be much more than that. There are peas 3 ways- plump round peas, a smear of pea pureé and crispy pea shoots that squiggle at the end- a bright acidic cherry tomato confit, a dollop of smokey red pepper gel, dehydrated chorizo matchsticks and a warm roasted prawn bouillon poured tableside into the small porcelain vessel. There are textures, colors, shapes and temperatures, and of course, most importantly, a wealth of flavors. There are gasps at the table, 10 to be exact, for each diner who discovers that the sum of all parts tastes just like paella. Cortez has captured the very essence and soul of paella, each gracefully executed and carefully selected component merging for that climactic union. It is, for me, one of the few successful deconstructed dishes I have ever had- one whose detailed efforts have nothing to do with ego or pride, and everything to do with sincerity. I walk over to the open kitchen, curious to observe the artist in motion, and Cortez begins plating the fish course. 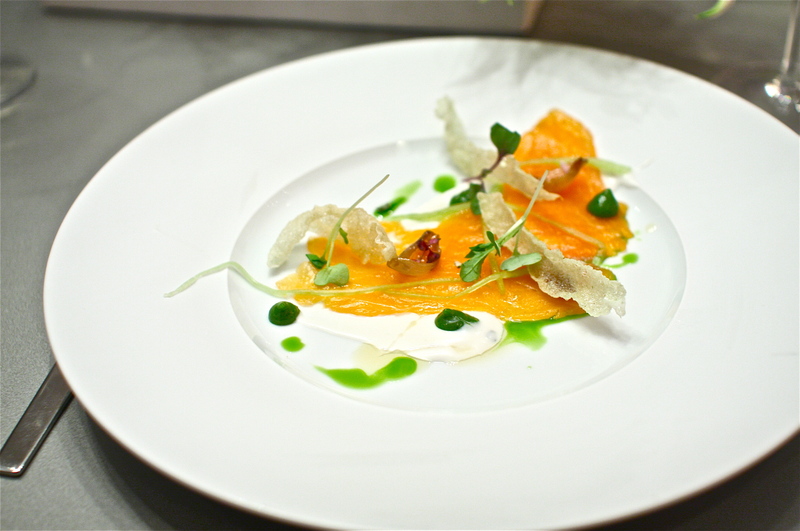 It is a beautiful specimen of Arctic char, brined in salt and 3 citruses, sliced paper thin and gently, ever so gently, draped on each plate. He garnishes the fish with shallots confited with Indian black peppercorns, crispy wedges of puffed bamboo rice and tiny drizzles of lemon balm oil of a vivid green hue for the finish. He is engaging, inviting and friendly as he shares his vision for this dinner- for it to be a fully immersed sensory experience like no other, where every aspect of the evening, from food to atmosphere, evokes beauty, style and thought. 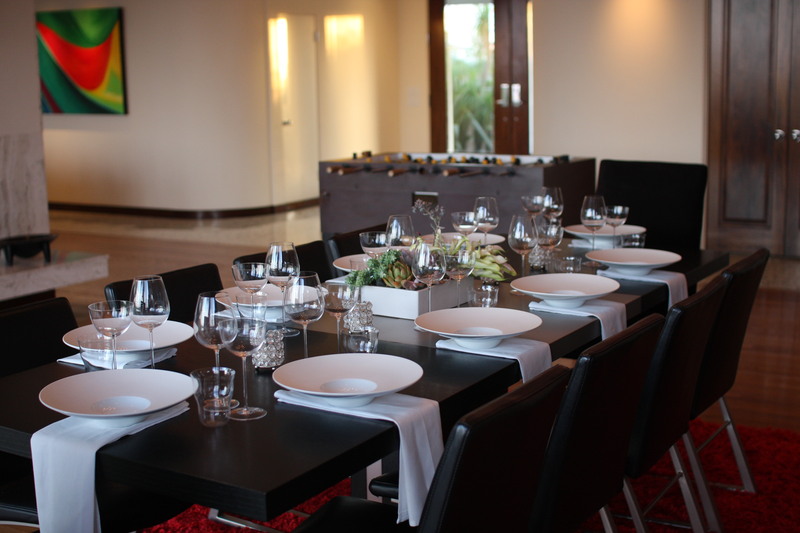 It is felt in his music soundtrack which he pairs with the food, and it is translated through each uniquely constructed tableware, from the wine glasses to the silverware which he has designed in collaboration with artists. The Thai coconut mojito cream and spearmint dots, for one, are easier scooped off the plate with his wide 2 prong fork while the tender fish cuts like butter with the contemporary rectangular knife. I ponder, for the first time, how form, function and design of silverware can really change how we enjoy eating. 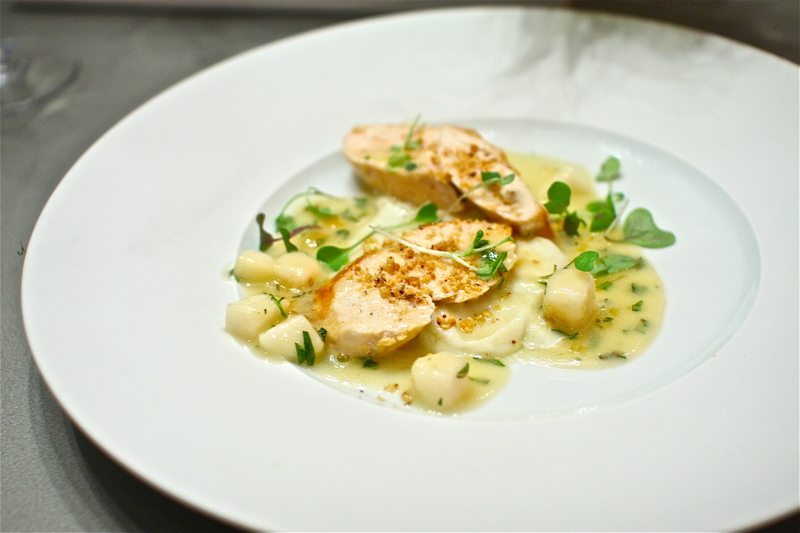 Buttermilk poached Santa Barbara chicken is pan roasted to perfection, juicy and moist, adorned with roasted hazelnuts, diced pears and a white wine, tarragon, vinegar and champagne sauce. There is something distinctly creamy and robust about the cauliflower pureé, and we find out that cocoa butter is the secret ingredient. By this course we have learned to let go and be fully present in the moment, letting each bite lead us further into Cortez’s world. His expression through his food is honest and pure- there is no attitude or vain- and it makes us believe that nothing else matters but for the company we are in, the food on our table and how it makes us feel. This chicken dish, for one, makes me happy. A creamy risotto is served with a sweet Syrah reduction, a deep ruby sap that is also painted, in one fluid brushstroke, along the curve of the plate with a little dusting of smoked bacon powder at its crest. Finely ground coffee beans hiding in the Syrah sauce create a pleasant surprise of crunch and grind which, subsequently, releases a powerful surge of robust caramel aromas. Within milliseconds my palate, my nose and my thoughts are filled with the memories of one particular autumn in Paris- the smokey cafés where I lingered over his every word, how we toasted all night long with bottles of Burgundy, then walked aimlessly, hand in hand, through the desolate cobblestone streets of Paris until sunrise, avoiding conversation about our imminent farewell. Cortez serves a shiitake mushroom cappuccino inside a custom-made ‘big spoon’, a wine glass and spoon hybrid which, by design, forces me to hold the handle by both hands and stick my face deep into the vessel, nose first. It creates a tight vacuum of earthy bouquets that brings me face to face with the food, giving me no alternative but to surrender and accept. It draws out my vulnerability in the best possible way, and I get another flood of memories of that same autumn in Paris, this time with an infusion of sadness, yearning and desire that I cannot hold back. 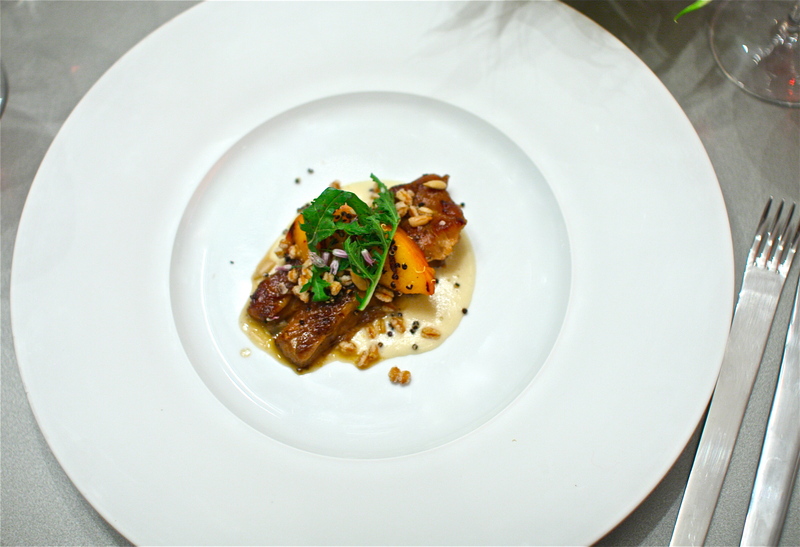 I am still consumed with emotion during the Mangalitsa pork dish, moist short ribs glazed in a rich bone sauce with ginger lacquered grilled peaches that shine bright with end-of-summer sweetness. There is a silky ecru corn cob velouté that tastes just like corn cob, a perplexing delight of sweetness and earthiness that blossoms in the company of puffed black quinoa and hearty farro. The ‘big spoon’ reemerges for the first of the desserts, a motion for us to enter yet again into a very intimate and personal experience. There is silence for a few long seconds as we bury our faces into the mouth of the spoon and bask in the chilly mist that languidly caresses our cheeks. The icy mist dissipates and the spoonfuls of Douglas fir and tangy greek yogurt granités begin to slowly melt and shift, and we gulp them down together with the sweet Charlynn melon broth. The CR8 finale is a breathtaking study in design, form and architecture, a surreal yet controlled landscape of abstract expressionism that has the makings of a magnificent Miró. 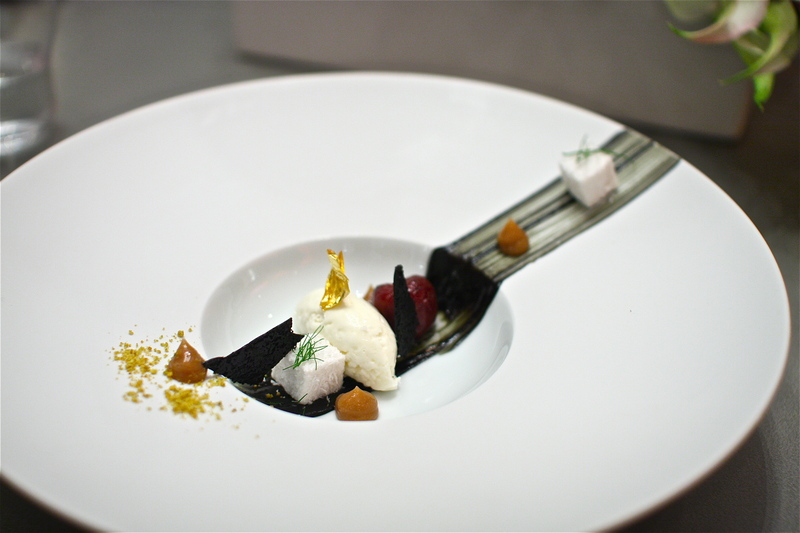 ‘Bollywood explosion’, it is called, a precise composition of coconut marshmallows, black vanilla paper, milk ice cream, chai gel, fennel fronds and liqueur de cerise marinated Rainier cherries on a carpet of dark vanilla bean paint. There is jewelry- honey golden pistachio dust and a delicate 24K gold flake- to authenticate the lavishness of this Bollywood portrait which, Cortez explains, is a conceptualized inverted chai latte. I leave the dinner that evening, still intoxicated with the beautiful flavors that have kissed my palate. Every taste, smell, sound and sight of the dinner experience has a cumulative effect of creating an enchanted vortex of raw emotions, one so intense that would take me days to escape. Whether that is the intention of Cortez, I am unsure of, but in such an intimate setting where chef and diner coexist, it is inevitable to become involved in the creative process, and what begins as his artistic interpretation ultimately becomes my own private, and quite visceral, experience. My mind trudges through a plethora of memories that evening, wandering aimlessly through the desolate cobblestone streets and back to the smokey cafés, and I toss and turn in my bed until sunrise, consumed with the memories of that autumn in Paris. I remember feeling simultaneous joy, sorrow and everything in between, for that is what love does, and love I did, that autumn in Paris, with fierce passion and reckless abandon. I feel a tightness deep in my chest, just as I felt back then, standing on that dark street corner in Paris, looking up at the moon and a lamppost like O’Keefe in New York. Random trivia- Did you know that freshly harvested vanilla beans have no flavor or aroma? To develop their signature flavor, the beans must be cured and sun-dried for several months. This entry was posted in Los Angeles, CA- Restaurants and tagged arctic char, Bollywood explosion, Charlynn melon, coffee, CR8, dining, Enchanted paella, farewell BBQ summer, Food, Frida Ahumada, lemon balm oil, Los angeles, Mangalitsa pork, puffed bamboo rice, risotto, Roberto Cortez, spearmint drops, Syrah reduction by tomostyle. Bookmark the permalink. Just found your blog. Great looking meals (and photos)! You might want to check out some of my own LA (and sometimes elsewhere) gluttony. Some of the big dinners are here with a full index here. Thank you for your comment! Looks like you like to eat and snap photos too! Big time. I even wrote a blog post on “foodie photography.” But I have to say, the eating part is more fun. Gorgeous! I had a lovely dinner by Roberto a couple of years ago. http://mylastbite.wordpress.com/2009/10/27/roberto-cortez-hatchi-dinner/ I must do it again soon. Thank you Jo! I looked at your Hatchi dinner photos- all of his dishes look beautiful and delicious. I hope you get to attend one of his upcoming dinners- it’s an amazing experience, and I think you will really love it! You’re one of the many reasons I love to hear women go on and on about food. Thanks for another sensual tale. Thanks Bill! You know I can go on and on about food forever!